In recent studies concluded that most people are better able to absorb calcium from dairy sources compared to synthetic calcium. In addition, dairy calcium has been shown to be more effectively deposited in bone because of less interference with the bone renewal process. Mil-gel™ an ideal breakthrough product for building and maintaining strong bones, assures you a highest calcium intake level. Mil-gel ™ is a truly 100% absorbable calcium extracted from a dairy source such as milk which gives highest bioavailability and absorption. In recent studies concluded that most people are better able to absorb calcium from dairy sources compared to synthetic calcium. In addition, dairy calcium has been shown to be more effectively deposited in bone because of less interference with the bone renewal process. 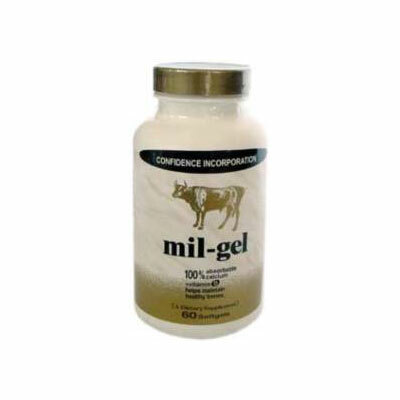 Mil-gel™ an ideal breakthrough product for building and maintaining strong bones, assures you a highest calcium intake level. Regulation of cell function, nerve conduction, muscle contraction, blood coagulation. Osteoporosis, hypertension, gestational hypertension, hyperglycemia. Recent studies concluded that the best way to obtain calcium is by consuming food that naturally contains calcium such as milk. It has been proven that most people are better able to absorb calcium from dairy sources compared to synthetic calcium. This is why Mil-Gel provides 100% absorption of calcium. Dairy calcium has been shown to be more effectively deposited in the bone because of less interference with the bone renewal process. Mil-Gel has the ideal calcium utilization at the bone level to give a 50% more bone density than other sources. Both calcium and phosphorus are required for bone development, and changes in bone characteristics have been linked to having the appropriate ratio of calcium to phosphorous. Mel-Gel has a 1.8 : 1 ratio of calcium to phosphorous. This is the same ratio as that found in the human bone and the main reason why Mil-Gel can build greater bone density. Many other minerals such as Mg, K, Zn and Cu are also required for optimal bone growth and health. Milk has long been recognized as providing a great mineral balance. Mil-Gel is the first such product to be manufactured in the U.S. to give an ideal composition of these essential minerals. Magnesium: Magnesium is a component of the bone structure and helps to boost calcium absorption. Research suggests that Magnesium may also reduce bone loss and contribute to maintaining bone mineral density. It plays a role in nerve impulse transmission and protein synthesis. Also, functions to provide stability to ATP (the energy molecule) in the body. Potassium: Potassium contributes to maintaining bone mineral density. Insufficient levels of potassium contribute to bone fragility. Calcium/Phosphorous Ratio: Similar ratio to that found in the human bone and milk. Both calcium and phosphorous are required for bone development and changes in bone density have been linked to having the appropriate ratio of calcium to phosphorous. Lactose: Contains 9% lactose, which stimulates the transport of calcium for intestinal absorption; the retention of calcium once absorbed by the body by inhibition of the citric acid cycle; the absorption of other important elements such as magnesium, barium, and zinc. Protein: Helps aid in the solubility and suspendibility of calcium. Particle Size: Available in two forms: a finer milled product which offers a smooth mouth feel and better suspendibility in fluid applications. Citrate: No citrate is added, however, it does contain 9% milk citrate.